September 30 marked the end of the 2016 fiscal year, and with it, yet another 12-month period that U.S. sugar policy operated at no cost to the American taxpayer. And, as we are one-third of the way through with FY2017, the Congressional Budget Office (CBO) signaled its expectation that sugar’s recent run of zeroes will continue. CBO recently released its newest budget baseline, which repeated prior estimates that U.S. sugar policy will cost $0 over the life of the current Farm Bill. CBO also added another year to its projection, saying sugar policy should continue to cost $0 through the year 2020. CBO isn’t alone. 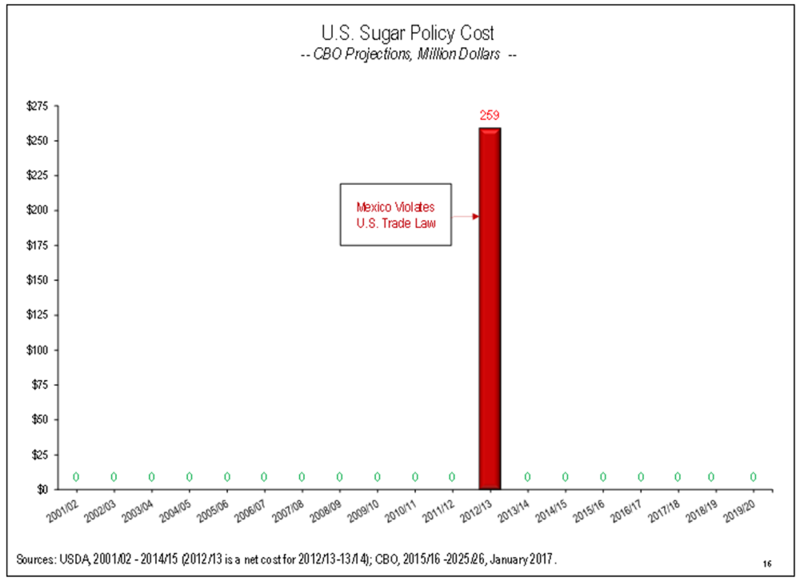 In late-November, the U.S. Department of Agriculture released its long-term expectations of U.S. sugar market conditions, indicating its belief that sugar policy should remain no cost through 2027. Combine future projections with sugar policy’s past track record, and you’re staring at a whole lot of zeroes on the government’s balance sheets – a real anomaly in Washington today. Sugar policy is based on loans repaid with interest, not subsidy checks, which is why it cost taxpayers $0 in ’03, ’04, ’05, ’06, ’07, ’08, ’09, ’10, ’11, ’12, ’14, ’15, and ’16. The only blemish on sugar’s no-cost record came in 2013 when the USDA acted to keep the market from collapsing after Mexico violated U.S. trade law and dumped subsidized sugar. Mexico’s actions cost U.S. taxpayers $259 million – which still represented less than 0.25% of Farm Bill spending that year – but resulted in more than $1 billion in damage to U.S. sugar producers. After U.S. producers challenged these actions, the U.S. government ruled against Mexico and removed the threat, so sugar policy’s no-cost success story could continue.